Impeccably renovated penthouse unit with VIEWS and expansive decking! Sand Castle Condo's unique staggered design gives this southern end unit grand exposure to be enjoyed even when northerly winds blow. Cork flooring, soft palettes and beadboard wainscoting blend modern and rustic moods, granite counters with space saving stainless appliances make the kitchen streamlined and smart. High ceilings create an airy feel and plantation blinds filter sunlight. Smart design allows open living area with flexible seating arrangements. Mix drinks at the stylish drybar with granite counter, then dine at the kitchen bar, breakfast nook or formal space with mesmerizing views. Stately master suite, featuring a king sized bed, has private access to the east deck and a second bedroom lies at the other end of the home for privacy. Hall bath at entry with beautiful tile shower and nook with stack washer/dryer and storage cupboards. Beautiful furnishings convey, truly turn-key ready! Expansive sunny decking to west with unobstructed view of Wright Monument and easterly covered decks with grand ocean vistas. 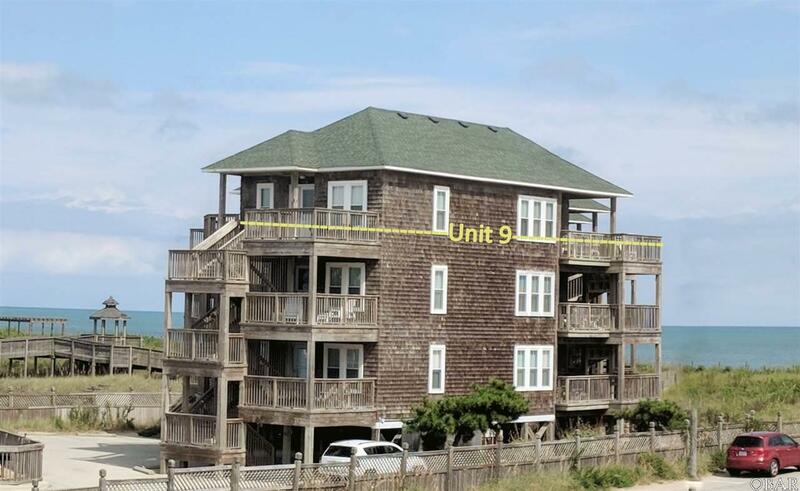 East deck provides stairwell leading to the beach, less than 100 yards away. On site community pool as well!